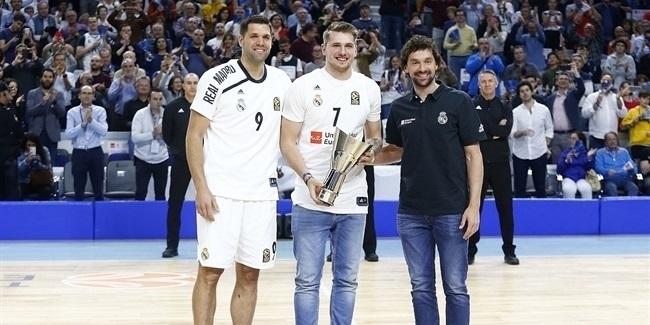 Felipe Reyes may not have made the headlines after Real Madrid's remarkable come-from-behind 101-99 victory over FC Bayern Munich on Thursday night, but without his hard work in the trenches throughout the game, Los Blancos would not have had the chance to win in the closing seconds. 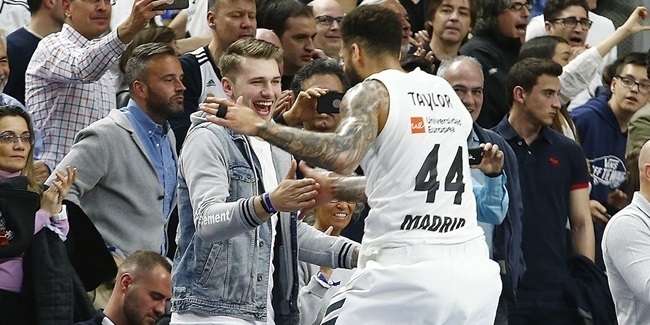 Reyes not only starred with a double-double, but he also captured the title of MVP for Round 4 of the Turkish Airlines Euroleague Regular Season. Reyes totaled 20 points, 11 rebounds, 2 assists, 1 steal and 1 block in compiling a performance index rating of 30, which was highest among all players in the round. He only missed 3 shots and drew 5 fouls. Reyes started strong with 14 points and 6 rebounds in the first 8 minutes to help Madrid race to a 25-11 lead. And when his team fell behind late, Reyes came up big again. His free throws tied the game at 96-96 to help set up a dramatic finish. This marks the third time in his career that Reyes is the Euroleague’s weekly MVP. Laboral Kutxa Vitoria big man Ioannis Bourousis narrowly missed his second weekly MVP title in three weeks; he amassed a performance index rating of 29 in a narrow 92-90 overtime victory against Anadolu Efes Istanbul. Bourousis posted 18 points, 11 rebounds and 2 blocks. Not far behind were Olympiacos Piraeus center Patric Young and CSKA Moscow playmaker Milos Teodosic, who each recorded index ratings of 28. Young helped the Reds beat Limoges CSP 75-49 with 13 points, 10 rebounds and 5 blocks. Teodosic guided CSKA past Darussafaka Dogus Istanbul 75-80 in the Game of the Week with his 22 points and 9 assists. Rounding out the list of Round 4 stars were Darussafaka center Marcus Slaughter and Efes playmaker Thomas Heurtel, who each had index ratings of 27. To reach those numbers, Slaughter tallied 13 points, 8 rebounds and 3 blocks and Heurtel scored 26 points and dished 6 assists. Efes guard Thomas Heurtel was Round 4's best scorer with 26 points, while Alessandro Gentile of EA7 Emporio Armani Milan is the top scorer for the season with an average of 19.3 points per game. 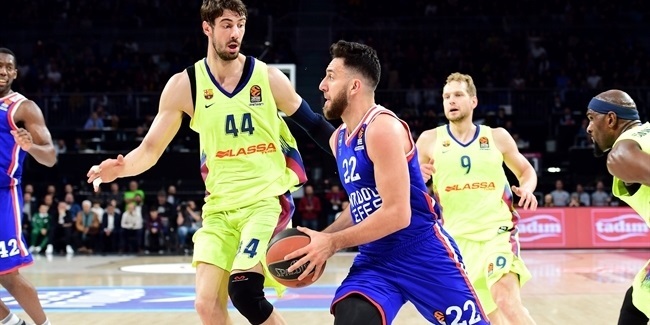 Round 4 MVP Reyes and Laboral big man Bourousis were Round 4's best rebounders with 11 rebounds apiece. Bourousis now leads the league in rebounding this season with an average of 8.8 boards per game. Brose Baskets Bamberg big man Nicolo Melli and Olympiacos guard Vassilis Spanoulis each dished 10 assists on Thursday to sit atop the list of weekly leaders. Heurtel is this season's assists leader with an average of 8.5 per game. No player had more steals this week than Panathinaikos Athens guard Sasha Pavlovic's 4. Bamberg playmaker Bradley Wanamaker is averaging 2.5 steals per game this season to lead all players. Patric Young was not only Week 4's top shot-clocker with 5 rejections, but his average of 2.5 blocks is the most in the league this season. Five players recorded double-doubles in Round 4. They were the weekly MVP Reyes (20 points, 11 rebounds), Bourousis (18 points, 11 rebounds), Young (13 points, 10 rebounds), Spanoulis (10 points, 10 assists) and Mateusz Ponitka (13 points, 10 rebounds) of Stelmet Zielona Gora.